Santa Claus with magic computer tablet. Father Christmas giving thumb up. Christmas, advertisement, technology and people concept. Santa Claus with presents. Santa is laughing. The Christmas magic. Santa Claus showing thumbs up outdoors. Portrait of happy elderly man in costume of Santa Claus giving thumb up with two hands. Believe in Christmas miracles. Santa holding digital tablet with blank screen. Cute bearded Santa with computer tablet giving thumb up. Best gift for Christmas. Cute Santa with gifts and thumb up. Old Father Christmas is giving thumb up and smiling on blue bokeh background. Festive seasonal time. Cheerful Santa giving thumb up. 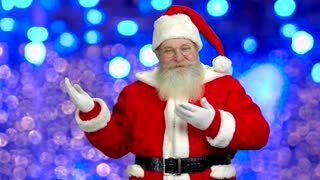 Old Santa Claus with real beard holding gift boxes on blurred background. Special Christmas offer. 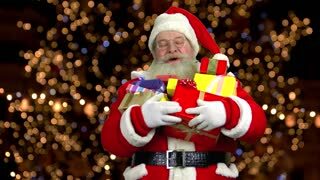 Old traditional Santa Claus with Christmas gifts. Happy authentic Santa Claus giving thumb up on black background with golden lights.